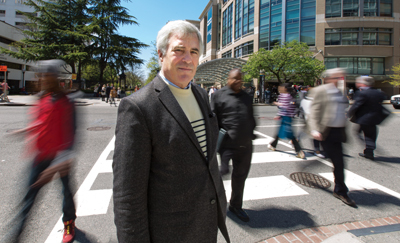 Chris Leinberger ’72 is in the thick of the walkable urban development scene on the George Washington University campus near the Foggy Bottom metro station. Photo by Laurence Kesterson. With 3 million residents, Minneapolis–St. Paul has the 15th largest metro area in the United States—bigger than Pittsburgh’s but smaller than Philadelphia’s. Like all metropolises, the Twin Cities have their own histories. But they also share a larger urban history of the country, a history that for most of the last century was defined by the automobile-led push from city centers into the suburbs. “In general, we followed the same arc as other American cities that saw a lot of suburban development,” says Mark VanderSchaaf ’72, director of regional planning at the Metropolitan Council, which provides regionwide infrastructure for the Twin Cities’ metro area. Though he recalls being interested in city planning from eighth grade on, VanderSchaaf took a circuitous path to his profession. The Swarthmore history major pursued a doctorate in religion at the University of Iowa and taught college for four years. “The courses I was teaching were interdisciplinary, and I learned to focus on cities as the places where various historical and cultural trends were taking place,” he says. That inspired VanderSchaaf to pursue a master’s degree in city planning at the University of Wisconsin, then spend 17 years as a city planner for St. Paul, before joining the Metropolitan Council. He’s directed the agency’s planning function since 2004. In that decade, the Twin Cities and their suburbs have begun to push back against the primacy of automobile transportation, most notably with an ongoing light-rail project that recalls an earlier era of walkable living. This push, too, is part of a nationwide trend. Perhaps trend is the wrong word. “I think this is a structural change, not cyclical,” says Chris Leinberger ’72, the Charles Bendit Distinguished Scholar and Research Professor at the George Washington School of Business and president of LOCUS, a coalition of real-estate developers who advocate for sustainable, walkable urban development. In the course of human history, sprawl is an anomaly. Many of the cities we associate today with sprawl were built with other forms of transportation in mind. Atlanta began as a railroad town, the transit hub of the Southeast. In the early 1800s, city residents relied on streetcars and trolley buses. But Atlanta stopped running streetcars in 1949, and trolley buses ceased operations in 1963. Greater Los Angeles’ streetcar system (Pacific Electric’s “Red Cars”) once connected Pasadena, downtown Los Angeles, San Bernardino, Long Beach, and other surrounding cities. “In 1945, it was the most expansive passenger-rail service in the world,” Leinberger says. The Red Car line was longer than New York City’s subway system. But in 1961, Red Car operations ceased. What happened? A common shorthand explanation is that when in Europe fighting the Nazis, Gen. Dwight Eisenhower, was impressed by Germany’s Autobahn system. In 1956, President Eisenhower directed federal dollars toward the highway system—at rail’s expense. “For new development, we made walkable urban spaces illegal to build in almost every jurisdiction,” Leinberger says. “Instead, we saw a super-low-density development pattern taking advantage of the country’s abundance of land. This was drivable suburban development, where you separate residential from commercial, where you put universities and hospitals—‘eds and meds’—somewhere else.” Automobiles made nonwalkable suburbia possible. To be sure, the automobile also influenced life outside the United States. But European cities didn’t experience a similar degree of sprawl. (Metro Washington, D.C., has one-eighth the population density of metro Paris.) And sprawl was reinforced in the United States by desegregation and “white flight.” “The rise of drivable suburban development allowed people to self-segregate,” Leinberger says. Several factors have contributed to the return of pedestrianism. In the 1990s, baby boomers were increasingly drawn back to cities, many of which were experiencing precipitous drops in crime. “Without crime falling, I don’t think this walkable urban era would have happened,” Leinberger says. Three of the Twin Cities’ walkable-living advocates meet up in St. Paul’s Union Depot, where a light-rail stop was set to open this June. From left: Russell Stark ’95, Mark VanderSchaaf ’72, and Libby Starling ’92. Photo by Courtney Perry. The same can be said of Atlanta. “At GWU, we did an analysis of Atlanta and were shocked to find that in the real-estate cycle that began in 2009, we have seen the end of sprawl,” Leinberger says. Sixty percent of the development was taking place in just 1 percent of the land. Atlanta introduced a light-transit system and began building sidewalks on former commercial- and industrial-zoned areas. Still, the region’s new light-rail system has allowed Stark and his allies to paint their opponents as enemies of progress. “In St. Paul, the argument that won them over was that we risk being left out of the system, with all its ancillary economic benefits,” he says. The Twin Cities’ rail-transit system had a curious start. In the late 1990s, Minnesota’s eccentric governor and ex-professional wrestler, Jesse Ventura, had an epiphany. “He said he wanted to be able to take a ride in a train, so his leadership resolved a debate that had been going on for decades,” VanderSchaaf says. The region’s first light-rail line opened in 2004, connecting downtown Minneapolis, the Mall of America in Bloomington, and the Minneapolis-St. Paul International Airport. City planners scrambled to change zoning laws and plan for walkable development along the corridor, “but with that first line, all the preparations weren’t quite there yet,” VanderSchaaf says. 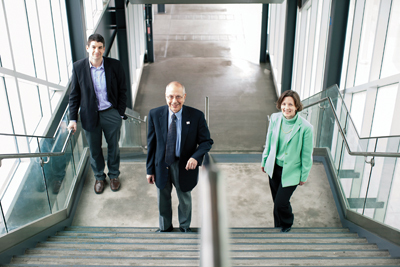 He started at the Metropolitan Council the year the region’s second light-rail line opened, and he’s been more directly involved with the planning of the rail’s second line, slated to open in June with 23 stops along 11 miles, connecting the Minneapolis and St. Paul downtowns. “This time the two cities overhauled their zoning codes in advance to allow for mixed-use development, and a strong team of public, private, and nonprofit partners are already bringing a pipeline of investment into the corridor,” VanderSchaaf says. 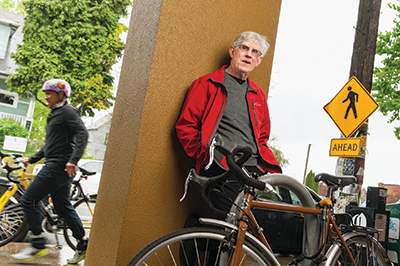 Carl Abbott ’66 is right at home in bike-friendly, walkable Portland, Ore., a veritable progressive person’s paradise. Photo by Steve Hambuchen. Many cities, such as Philadelphia, Boston, and Washington, have started or are planning initiatives “centered on reducing or freezing property taxes for [working- and lower-middle-class homeowners] in an effort to promote neighborhood stability, preserve character, and provide a dividend of sorts to those who have stayed through years of high crime, population loss, and declining property values,” The New York Times recently reported. Still, such measures, which themselves are small, don’t account for low-income renters, who find themselves pushed out unless they can avail themselves of rent-controlled apartments or subsidized housing. “What you’re seeing increasingly are suburban low-income, often immigrant communities in the inner-ring suburbs that aren’t necessarily walkable or well connected by public transit,” Abbott says. “The great challenge of this new era of walkable urban development is affordable housing,” Leinberger says. But perhaps if the era of new suburban, drivable development is in fact over, as he believes, then this problem will someday end. Walkable living will be available for all, just as it was in the not-too-distant past.